Description: KetoVie Café Veggie Dip Mix has a ketogenic ratio greater than 4:1 when made with REAL mayonnaise and is delicious served with your favorite vegetables or snacks. KetoVie Café Veggie Dip Mix adds to snack options for individuals following the spectrum of ketogenic diets. 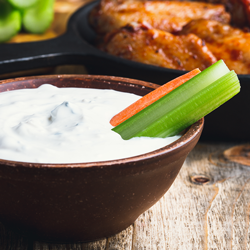 Each package contains 6 packets of dry mix which when mixed with 1 cup of mayonnaise makes 8 - 28 gram servings of high in fat, low in carb, delicious dip. KetoVie is designed for individuals over one year of age and indicated for the dietary management of intractable epilepsy and other conditions managed by a ketogenic diet. Preparation: In a bowl, combine contents of 1 packet dip mix with 1 cup regular mayonnaise. Mix well. Refrigerate for 1 hour before serving. Makes eight 28g servings of creamy delicious dip. Storage: Store unprepared mix in a cool, dry place. Once prepared, store refrigerated up to 3 days. Ingredients: Creamer (pasteurized sweet cream, skim milk solids, sodium caseinate, soy lecithin, BHT [antioxidant]), carrots, onion, tomato, spinach, celery, bell pepper, garlic powder, salt, pepper. Contains milk and soy.